Some of the most important evidence that was collected during this study came from systematically interviewing many stakeholders, at all levels of the health and educational systems, as well as the occupational therapists. Interview questions, both for individual interviews and focus groups, were based upon an Implementation Science Framework developed by the research team. Themes that emerged provide guidance for future implementation and sustainability. An implementation science framework was used for thematic content analysis of the interviews and focus groups. Stakeholders at all levels of the health and education system participated willingly in individual interviews. Organized action system theories and a socio-constructivist approach to change management served as the basis for the implementation science framework developed by members of the research team. The framework was used to highlight the complex interactions between the factors that influence implementation and the sustainability of the model (Camden, Swaine, Tetreault, & Carriere, 2011; Camden, Campbell, Stewart, Dix, McCauley, & Missiuna, 2015). This framework was used to analyze data from many different sources, including 51 interviews and the OT focus groups. Organized action systems theories suggest that individuals and teams from different systems (e.g. health care, education, social services) interact within organizational structures and environmental contexts to produce services and to achieve goals. Implementation of a new service such as P4C requires management across several systems; knowledge and competencies change along the way at many levels within each system. There is reciprocal influence of the structures that are already in place: of each of the stakeholders and systems, and of the actions that are taken throughout the change process. Studying these interactions allows us to identify specific aspects of implementation of the P4C service and of the elements in each system that might need to change for it to be successful. Themes identified through the content analysis informed Lessons Learned. © 2015, Camden, Campbell and Missiuna. The new service that is being studied using this framework is Partnering for Change, as it was originally designed. It encompasses all the principles of the model itself, the recommendations and the evidence sustaining it, as well as the recommended interventions delivered by the OTs. This section includes all of the stakeholders involved with P4C (e.g. decision-makers, educators, OTs, principals, client services managers, care coordinators, etc.). The actions of people involved with P4C may be influenced by their organization’s structures, resources and regulations; but people can also influence the organization and the environment. Ultimately, decisions are made around the processes involved in delivering P4C, and the outcomes of the intervention. The characteristics of the stakeholder, as well as their perceptions of the P4C service and of the change required to deliver it, will influence their actions. The intentions of each stakeholder are dynamic and evolve; they include multiple and competing intentions but are focused on the organization’s goals and on providing the best care. Organizations (e.g. CCACs, school boards, service provider organizations etc.) are framed in a box since they consist of structures, administrative processes and resources that might be more difficult to change. However, people in those organizations can, by their actions, modify these structural elements to facilitate the implementation process. Their role within the organization, the organizational culture and many other elements in organizations will also come to play. The actual production of the P4C service results from the actions of many stakeholders. It is influenced by decision-makers (e.g. how much of the intervention is produced) as well as by the actual knowledge, skills and beliefs of the OTs as they deliver the P4C services. The outcomes of P4C are a result of the OT interventions, and of the way in which P4C was implemented. These outcomes may change, if P4C is implemented differently. What we are trying to determine through interview data, is the extent to which each of these other factors influences the impact of P4C services. Similarly, the success of the P4C intervention can impact on stakeholders’ intentions and actions and may lead to organizational change. P4C as a new model is being delivered in a societal, political and economic context that influences the delivery of services and the uptake of P4C. The P4C project and its partnerships may also influence the way we think about rehabilitation services for children with special needs. The Ontario Special Needs Strategy is an important part of the current environment in the province. 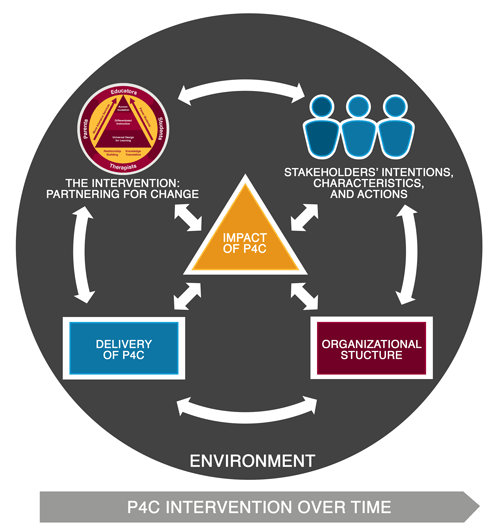 The arrow at the bottom of the figure represents the evolution of the P4C model over time. The change management and participatory action research activities over the past seven years have influenced the P4C model of service delivery. It is a dynamic and iterative process. In studying the change management process, we are interested in capturing pre-implementation, implementation and sustainability.